Fira offers its customers wheels coated with state-of-the-art technologies: cataphoresis e-coating and powder coating using its own plants. 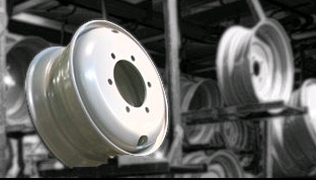 NANOTECHNOLOGY: applied during the pretreatment before coating, it creates a passivating film on the surface of the wheels to ensure perfect bonding in the cataphoresis process, increasing its resistance to saline fog. CATAPHORESIS COATING: this involves the deposition of a compact, drip-free film of uniform thickness on the surface of the wheel to provide extraordinary protection against chemicals and weather. CATAPHORESIS COATING + POWDER COATING: application of a polyester or polyurethane top coat to the cataphoresis coat gives the wheel an exceptionally shiny finish.